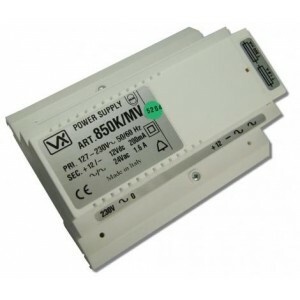 - Power Supply 13Vdc 1Amp, battery backup facility (12V-2A).- Fuse for overload protection.-..
Videx 2301N Door switch- This controller is required for systems with more than one entrance. .. The bus relay device can be used as either a relay within an apartment to activate when a phone ring..
Boxed 12/24v ac/dc relay outputs are 2 x single pole changeover rated at 240v 5 amps. It also includ..
- Power supply 230 Vac input, 8 Vdc and 12Vdc 250mA max outputs and 13 Vac 18VA output.- With el..
- Power supply 230 Vac input, 8 Vdc and 12Vdc 250mA max outputs and 13 Vac 18VA output.- In a st..
- Input 230Vac, Output 13.5Vdc 0.8A continuous (1A pulsed) and 13.5Vac 1.6A (pulsed).- In a stan..
Unboxed two pole dry contact change over relay 12Vdc coil ..